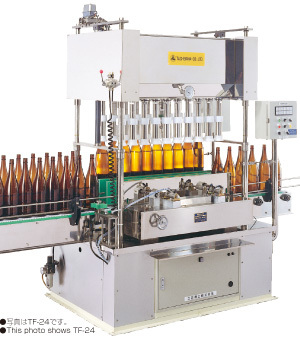 This filler is uniquely designed and developed as an useful filling machine applying for the varied types of bottling, achieving the reasonable system quite different from the conventional sending-blade method. The cost and time for replacement are eliminated without using the sending-blades. 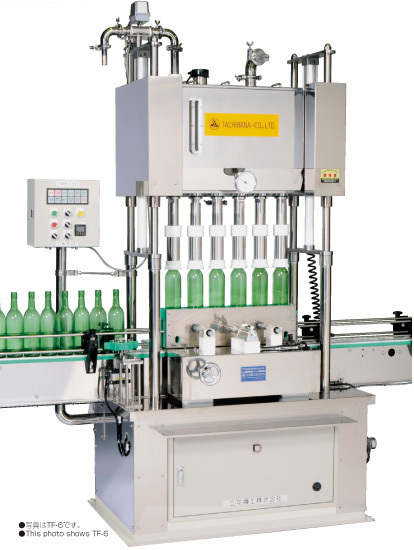 Switching of bottles is made by one-touch operation. Replacement parts are almost unnecessary. This filler is the most useful for liquid products such as liquors, portable water, liquid condiments （soy sauce, vinegar etc.）. ●Filling ability change according to the size of nozzles. TF-16〜24 type can have two different lines for filling two types of bottle by separating the tank.